Presentation buffs can now get their fix when they’re on the move, thanks to the mobile website SlideShare just launched about an hour ago. 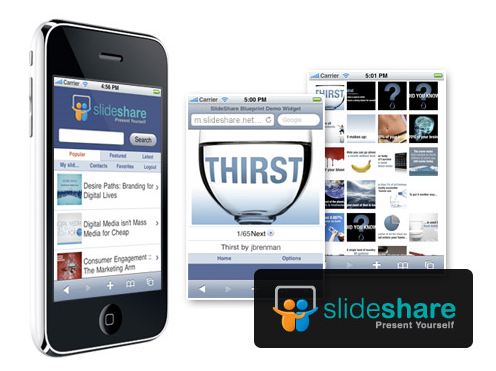 Simply point your mobile phone browser to m.slideshare.com and you’re good to go. Note that the mobile version is in beta at this point and was hacked together at Open Hack Day India last month (using Yahoo’s Blueprint platform), so there may still be some technical issues, warns the company. At the mobile site, you can take a look at the latest, featured and popular presentations if you’re using any smart phone and/or on all phones that have Opera Mini installed, and you can also search for slidedecks. There’s no requirement to download or install software on your phone, and it lets you log in to your account to view your favorite slidedecks and messages from your contacts. Comments are currently not displayed yet, and it doesn’t support upload from mobile phones, but other than that it works like it should; on my iPhone at least. To the best of my knowledge, this is the only mobile website that does this at this point, and considering SlideShare is one of the most popular cloud-based presentation sharing services there’s bound to be a heap of great content you can watch on the go. If there are any others, speak up in comments. SlideShare’s been doing some cool stuff lately, like launching a free Microsoft PowerPoint 2007 plug-in that allows for one-click publication of your presentations to the cloud, and support for embedding YouTube videos in SlideShare-hosted presentations. The company is based out of San Francisco and raised over $3 million in capital to date, from VC firm Venrock and a number of prominent angel investors like Dave McClure, Mark Cuban, Saul Klein, Jonathan Abrams, Hal Varian and more.